Another Onam round the corner and our dear old King Maveli must be well on his way 'up' from his abode. 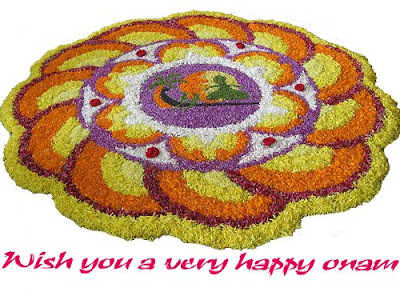 Surely its a pretty vibrant Onam for us Keralaites... we're a state in full blast, yay we rock!! Kerala State Beverages Corporation is having a rip-roaring time, apparently, with the record volume of sales in history. Bleh to recession! 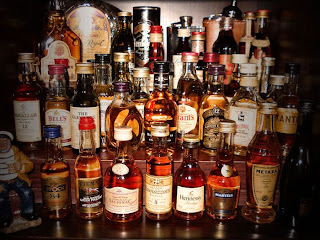 People are having a 'rum' time, that matters more! The most talked about name on that list is a highly educated folk, with a high-distinction in SSLC, same for PDC and is a product of a reputed Bangalore professional College. So the field is attractive for the affluent and the educated. Good luck to Maveli... Hope he got a good Life Insurance plan. Wait n see if he goes back down in one piece, and not sent further up. And if he manages to go back to Pathalam, he could consider adopting a lost, abandoned and insulted soul: Mr. K. Muraleedharan who is roaming around the state like a nomad, knocking at all doors. But all's not lost yet, good old Dad is fighting it out! And if you find that quotation groups don't suit your taste, why not join the youth wings of our Political parties and make your future secure... Each party feeds their own herd of prodigal sons: DYFI for the reds, Youth Congress for INC (no age-limit here), ABVP... Pick your team this Onam! The only difference I could see is that these are 'official' quotation gangs registered under the pretext of 'students wing' or 'youth wing', whereas the bona fide quotation gang will usually get registration under the goonda list of the Police. But don't worry, its like the IPL and the ICL, they all play the same game. Oh, and Salman Khan has his eyes on Kerala IPL team! Someone told me that it was Asin being the brand ambassador that caught the bad-boy's eyes...pssst... But what heinous crime did we do to deserve all this??? Let me add on some pretty uninteresting news on the way.. IIST opens its doors, IISER is well under construction, HDIL Cybercity is back on track, LNG Terminal in Cochin is well underway, the Real Estate sector is slowly coming back to life, the glamorous International Airport Terminal is fast nearing completion in Trivandrum along with the road-development projects... Pretty boring news for an average Keralaite but excusez moi for mentioning it.